2011 Acura TSX 4D Sedan 2.4 Technology FWD Basque Red Pearl 5-Speed Automatic with Sequential SportShift CARFAX ONE-OWNER!, Acura Technology Package with Navigation system, Heated Seats, Sunroof, Leather Seats, Bluetooth, Back up camera, Local Trade. 2.4L I4 DOHC 16V i-VTEC Please text, call or email our Internet Product Specialist: Jason Sherrill jasonsherrill@mungenast.com 314-856-5535. BELOW market value!! $360 in service coupons on ALL Pre-Owned vehicles!! 27-time Precision Award winning Acura Dealership - MOST in the Country!!! Ask about the Mungenast Difference... 2012 Acura TL 4D Sedan 3.5 w/Technology Package FWD Crystal Black Pearl 6-Speed Automatic Factory Recommended Service Performed, Acura Technology Package with Navigation system, Heated Seats, Sunroof, Leather Seats, Bluetooth, Back up camera. Odometer is 1449 miles below market average! 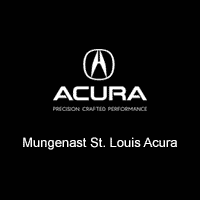 20/29 City/Highway MPG 3.5L V6 SOHC VTEC 24V Please text, call or email our Internet Product Specialist: Jason Sherrill jasonsherrill@mungenast.com 314-856-5535. BELOW market value!! $360 in service coupons on ALL Pre-Owned vehicles!! 27-time Precision Award winning Acura Dealership - MOST in the Country!!! Ask about the Mungenast Difference... 2011 Acura MDX 4D Sport Utility Technology AWD Bali Blue Pearl 6-Speed Automatic Acura Technology Package with Navigation system, Heated Seats, Sunroof, Leather Seats, Bluetooth, Back up camera. Odometer is 4243 miles below market average! 3.7L V6 SOHC VTEC 24V Please text, call or email our Internet Product Specialist: Jason Sherrill jasonsherrill@mungenast.com 314-856-5535. BELOW market value!! $360 in service coupons on ALL Pre-Owned vehicles!! 27-time Precision Award winning Acura Dealership - MOST in the Country!!! Ask about the Mungenast Difference... 2006 Nissan 350Z 2D Coupe Touring RWD Silver 5-Speed Automatic Electronic with Overdrive Heated Seats, Leather Seats. 3.5L V6 DOHC 24V Please text, call or email our Internet Product Specialist: Jason Sherrill jasonsherrill@mungenast.com 314-856-5535. BELOW market value!! $360 in service coupons on ALL Pre-Owned vehicles!! 27-time Precision Award winning Acura Dealership - MOST in the Country!!! Ask about the Mungenast Difference... 2011 Honda Odyssey 4D Passenger Van EX-L FWD Taffeta White 5-Speed Automatic CLEAN CARFAX!, Heated Seats, Sunroof, Leather Seats. 18/27 City/Highway MPG 3.5L V6 SOHC i-VTEC 24V Please text, call or email our Internet Product Specialist: Jason Sherrill jasonsherrill@mungenast.com 314-856-5535. 2011 Toyota Corolla 4D Sedan S FWD Nautical Blue Metallic 4-Speed Automatic Local Trade, Alloy wheels, Remote keyless entry. 26/34 City/Highway MPG 1.8L I4 DOHC Dual VVT-i Please text, call or email our Internet Product Specialist: Jason Sherrill jasonsherrill@mungenast.com 314-856-5535. Experience the Mungenast Difference! All vehicles priced at or BELOW Market Value... 2014 Hyundai Elantra GT 4D Hatchback FWD Geranium Red 6-Speed Manual ABS brakes, Electronic Stability Control, Heated door mirrors, Heated Front Bucket Seats, Heated front seats, Illuminated entry, Low tire pressure warning, Remote keyless entry, Traction control. Odometer is 8489 miles below market average! 24/34 City/Highway MPG I4 Please text, call or email our Internet Product Specialist: Jason Sherrill jasonsherrill@mungenast.com 314-856-5535. BELOW market value!! $360 in service coupons on ALL Pre-Owned vehicles!! 27-time Precision Award winning Acura Dealership - MOST in the Country!!! Ask about the Mungenast Difference... 2009 INFINITI G37 4D Sedan X AWD Liquid Platinum 7-Speed Automatic Electronic CLEAN CARFAX!, Heated Seats, Sunroof, Leather Seats. 3.7L V6 DOHC 24V Please text, call or email our Internet Product Specialist: Jason Sherrill jasonsherrill@mungenast.com 314-856-5535. 2010 Toyota Avalon 4D Sedan Limited FWD Classic Silver Metallic 6-Speed Automatic Electronic with Overdrive CLEAN CARFAX ONE-OWNER!, Heated Seats, Sunroof, Leather Seats, Cooled/Ventilated seats, Local Trade, Avalon Limited. Odometer is 26605 miles below market average! 19/28 City/Highway MPG 3.5L V6 SMPI DOHC Please text, call or email our Internet Product Specialist: Jason Sherrill jasonsherrill@mungenast.com 314-856-5535. Experience the Mungenast Difference! All vehicles priced at or BELOW Market Value... 2012 INFINITI G25 4D Sedan X AWD Black Obsidian 7-Speed Automatic with Manual Shift Heated Seats, Sunroof, Leather Seats, Bluetooth, Back up camera. Odometer is 1426 miles below market average! 19/27 City/Highway MPG 2.5L V6 DOHC 24V Please text, call or email our Internet Product Specialist: Jason Sherrill jasonsherrill@mungenast.com 314-856-5535. Experience the Mungenast Difference! All vehicles priced at or BELOW Market Value... 2011 Chevrolet Camaro 2D Coupe 1LT RWD Victory Red 6-Speed Automatic with TapShift Sunroof, Bluetooth, Camaro 1LT. 3.6L V6 SIDI VVT Please text, call or email our Internet Product Specialist: Jason Sherrill jasonsherrill@mungenast.com 314-856-5535. BELOW market value!! $360 in service coupons on ALL Pre-Owned vehicles!! 27-time Precision Award winning Acura Dealership - MOST in the Country!!! Ask about the Mungenast Difference... 2014 Nissan Altima 4D Sedan 3.5 SL FWD Pearl White CVT with Xtronic Navigation, Heated Seats, Sunroof, Leather Seats, Bluetooth, Back up camera, Collision Mitigation. 22/31 City/Highway MPG 3.5L V6 DOHC 24V Please text, call or email our Internet Product Specialist: Jason Sherrill jasonsherrill@mungenast.com 314-856-5535. BELOW market value!! $360 in service coupons on ALL Pre-Owned vehicles!! 27-time Precision Award winning Acura Dealership - MOST in the Country!!! Ask about the Mungenast Difference... 2011 Ford Explorer 4D Sport Utility Limited AWD Tuxedo Black Metallic 6-Speed Automatic with Select-Shift Navigation, Heated Seats, Leather Seats, Back up camera. 3.5L V6 Ti-VCT Please text, call or email our Internet Product Specialist: Jason Sherrill jasonsherrill@mungenast.com 314-856-5535. Experience the Mungenast Difference! All vehicles priced at or BELOW Market Value... 2016 Chevrolet Malibu Limited 4D Sedan LS FWD Summit White 6-Speed Automatic Electronic with Overdrive CLEAN CARFAX ONE-OWNER!, Bluetooth, 6 Speakers, AM/FM Stereo w/CD Player & MP3 Playback, Steering wheel mounted audio controls. Odometer is 7770 miles below market average! 24/34 City/Highway MPG 2.5L 4-Cylinder DGI DOHC VVT Please text, call or email our Internet Product Specialist: Jason Sherrill jasonsherrill@mungenast.com 314-856-5535. BELOW market value!! $360 in service coupons on ALL Pre-Owned vehicles!! 27-time Precision Award winning Acura Dealership - MOST in the Country!!! Ask about the Mungenast Difference... 2012 Buick Enclave 4D Sport Utility Leather Group AWD Quicksilver Metallic 6-Speed Automatic CLEAN CARFAX ONE-OWNER!, Heated Seats, Leather Seats. 3.6L V6 SIDI DOHC VVT Please text, call or email our Internet Product Specialist: Jason Sherrill jasonsherrill@mungenast.com 314-856-5535.